Iranian FM Mohammad Javad Zarif (L), Russian FM Sergei Lavrov (C), and FM Mevlüt Çavuşoğlu (R) shake hands after a joint statement following consultations on Syria, at the European headquarters of the U.N. in Geneva, Switzerland, Dec. 18. As 2018 nears an end, the year has failed again to turn the world into a better place to live in. Nor has it has become any happier or safer. Enmity and strife, war and conflict keep driving our world apart, and it's both sad and dangerously alarming. The Middle East continues to remain a source of global tension and focus of international concern. It attracts enormous humanitarian effort. The settlement of a long-lasting conflict in Syria tops the international agenda. It both instigates divisions ranging with confrontation and fosters alliances for a new Middle Eastern architecture. As an immediate neighbor of Syria, Turkey is at the core of the ongoing situation there, and the course of events generates its grave concern over regional stability. It's a driver of Turkish foreign policy and military initiatives to shape relations with close and distant neighbors. All in all, developments in the Middle East at large – while varying by scope and motivation and polarized by targeted approaches – have fostered through 2018 an emergence of a new order buttressed by surprising and until recently unexpected interactions. Turkey, Russia and Iran give an impressive example in this regard through jointly working on a Syrian peace settlement in the frameworks of a trilateral format known as the Astana process. In matters of regional stability, a further Turkey-Russia rapprochement producing a closer security interaction has been at the focus of attention through 2018. Intense fiduciary contacts at the highest level have continued to contribute to every sector in Turkey-Russia interactions, from the export of tomatoes to the procurement of the S-400 air defense system and the construction of the TurkStream gas pipeline in conjunction with a regional security effort in the framework of the Astana process on the Syria peace settlement. In the meantime, no less important has been a continued miscommunication between Turkey and the U.S., which supports the People's Protection Units (YPG), the PKK affiliate in northern Syria. It has resulted in mounting Turkey-U.S. tensions, prone to confrontation. Through 2018, the U.S. positions in the Middle East have continued to generally weaken to result in its growing support to and affiliation with the YPG. This has made increasingly apparent the presence of a U.S. hidden agenda and its intention to remain a part of the Syrian post-conflict settlement at any cost. Even through severing relations with Turkey, its strategic ally in the Middle East and the only Muslim country to be a member of NATO. The continuing miscommunication with the U.S. has aggravated Turkey's security concerns. Seven years of civil war in Syria have led to Turkey following its own national security priorities and a multilateral strategy of alliances. In December 2016, Turkey, Russia and Iran signed a tripartite cooperation agreement to lay the grounds for the Astana process on a peace settlement in Syria. In October 2018, Turkey hosted the first ever quadrilateral summit on Syria where the Turkish, Russian, French and German leaders agreed on a general plan for resolving the Syrian crisis. In communication with the U.S., Turkey has repeatedly pointed out that there is no difference between the PKK and YPG, as both are terror groups. Ankara has also called on the U.S. to halt its YPG support but was never fully heard by Washington. Eventually, Turkey announced on Dec. 12 its decision to carry out a military operation east of the Euphrates River in Syria to cleanse the YPG controlled areas. "It is time to realize our decision to wipe out terror groups east of the Euphrates," announced President Erdoğan at the Turkish Defense Industry Summit in Ankara. On Dec. 13 and ahead of the imminent operation, Turkey carried out airstrikes to destroy tunnels and warehouses built by PKK terrorists in the Sinjar and Mount Karajak regions in northern Iraq. By now, the Astana process on a peace settlement in Syria has turned into a front runner of a newly emerging Middle East architecture. Never envisaged to replace the Geneva talks on Syria, the Astana mechanism was launched in January 2017 as a supplement to the U.N.-sponsored peace process. Besides virtually reanimating the kept in limbo Geneva peace talks, the Astana process resulted in establishing the de-escalation zones in the provinces of Idlib and parts of neighboring Latakia, Hama and Aleppo. To prevent a coming humanitarian disaster, Turkey and Russia stepped in and reached the Sochi agreement on Sept. 17, 2018, that envisaged a demilitarized zone of 15-20 kilometers between the warring parties and evacuation of heavy weapons and radical groups. Mikhail Emeliyanov, the first vice-chairman of the committee on legislation and state development of the RF Duma and head of the Russian delegation to the Black Sea Parliamentary Assembly (PABSEC), shared his reflections on the ongoing war in Syria. "Saying that the Astana process doesn't discount the Geneva peace talks, we remain aware that it has largely buried the talks in Geneva that revealed their lack of vital capacity. The very process that brought together Russia, Turkey and Iran have proved efficient not only for terminating the hostilities but for solving the refugee problem and the reconstruction of Syria as well. The three countries have shown resilience to solve regional problems without the global players. The Syrian problem is largely resolved without the U.S.," he said. 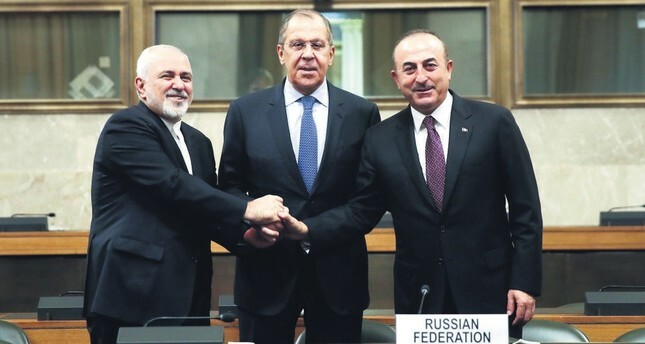 A cooperation platform launched in December 2016, by Turkey, Russia and Iran, laid down the grounds for their tripartite cooperation on a peace settlement in Syria known as the Astana process. Initially disregarded by the U.S., the established mechanism of interaction has started generating its concern and frustration ranging with destructive attempts when the interaction results became apparent. "Americans ignoring the Astana process is not surprising: They could either lead something or fully refrain from engagement. No way Americans can be the leaders of the Astana process and that is why they do their best to ruin or sabotage or undermine it," said Mikhail Emeliyanov. On the eve of his visit to Turkey this December, the U.S. envoy to Syria, James Jeffrey, suggested ending the Astana peace talks between Turkey, Russia and Iran because they are "generating no progress." "They tried and they failed, or at least up to this point they failed. The U.S. view is let's pull the plug on Astana," said Jeffrey, while adding "and then we go back to the U.N." That's generated a response from Turkish Foreign Minister Mevlüt Çavuşoğlu who said Jeffry's remarks were "very unfortunate." Today, the gains of the Astana peace process increasingly reveal its potential. "I'm sure that if Russia, Turkey and Iran manage to avert engagement in Syria of such a global player as the U.S., we'll be able to provide for adopting of a new Syrian constitution while involving into the process all the political forces in support of keeping Syria's territorial integrity. Elimination of terrorism and solution of economic problems are the necessary prerequisites for a sound constitutional process," Emeliyanov explained. "The U.S. is desperate to interfere into the ongoing in Syria political processes, but Turkey has taken a principled position on the matter by cutting short U.S. potential channels for interference. As such the U.S. is after the new ones, which is not an easy task," he continued. "It promotes its preferred mechanism to counteract the Astana process, the so-called Geneva process, but neither in Syria nor around it does the U.S. have any political or military capacity left to meaningfully compete with Russia, Turkey and Iran by influence in Syria. As such the U.S. has only one way out left: To split the Astana process and take out one of the parties – preferably Turkey – in order to jointly with this party to engage in the Middle East and Syria affairs anew," he concluded. The Astana process has contributed to cleansing the larger part of Syria from Daesh but didn't bring peace to the regions that were shortly overtaken by the regime forces. By mid-2018, Idlib in northwestern Syria was the last remaining opposition stronghold. Today the U.S. is using Daesh as an excuse to justify its presence in northern Syria and affiliation with the YPG. It's prompted a remark by Presidential Spokesman İbrahim Kalın at the 18th Doha Forum. "The U.S. presence in Syria went beyond its purpose and became another theater for proxy games in the region," Kalın said. "In Syria, the U.S. and the Astana process pursue opposing goals and this shall be on the mind in regard to potential scenarios there" summed up Mikhail Emeliyanov. "Parties to the Astana process fight against terrorism for a sovereign and single Syria. Keeping the conflict in Syria never-ending only meets the U.S. interests. Such a conflict would be undermining the Middle East stability thus enabling the U.S. to pressurize Turkey, Iran, Jordan and even the Gulf States. The Astana mechanism is to be kept alive – period, and its split prevented. The U.S. targets exactly the opposite." The importance and viability of the Astana process were stressed once again by the foreign ministers of Turkey, Russia and Iran who met for consultations on Dec. 18 in Geneva with the U.N. special envoy to Syria, Staffan de Mistura.